Our 100% online DOT HAZMAT Training: Function Specific – Using the Hazmat Table (HMT) course is for hazmat employees who need to use the Hazardous Materials Table on the job, such as those involved with the shipment, manufacture, or carrying of hazardous materials. This course meets function-specific training requirements for 49 CFR 172.704(a)(2)(i). Our online DOT HAZMAT Table Training – Function Specific course is designed for Hazmat employees involved with hazardous materials transportation, such as those who ship, manufacture, or carry hazardous materials. This course will help workers learn how to use the Hazmat Table to determine labeling, packaging, special provisions and restrictions for hazardous materials transport. This course meets function-specific requirements in 49 CFR 172.704(a)(2)(i). The course will include training on the symbols, proper shipping names and descriptions, hazard class and division, ID number and packaging groups, label codes, packaging requirements and more. See our Detailed Course Outline for more information. This course will expand upon the placarding training included in our DOT HAZMAT Training: Basic General Awareness (4 Hours) course. Our DOT HAZMAT Training: General Awareness/Function Specific (10 Hours) course includes the entirety of this HMT course’s training. Designed by Certified Outreach Trainers, this DOT HAZMAT Table HMT training is provided 100% online and is available 24/7. Taken through our state-of-the-art Online Training System (OTS), you will benefit from high quality, interactive training. The course is fully narrated and self-paced, so you can save your progress and train at your convenience. We also include a downloadable / printable student manual as reference material and to assist with note taking. Students may take up to 6 months, if desired, to complete the course after enrollment. To ensure customer satisfaction, we offer a 100% Money Back Guarantee*. 2 What is the HMT? Purpose of HMT | Where to find the HMR | Who uses the HMT | Hazmat Table categories | Basic Hazmat descriptions | Special information | Appendices to the HMT. The Hazmat Table column (1) symbols | +; A; D; G; I; and W | Multiple symbols | No symbol. Hazmat descriptions and proper shipping names | Italicized text and non-italicized text | Concentration ranges | “Mono” prefix | Liquids and solids | Hazardous wastes | Mixtures and solutions | Poison / poisonous / toxic | “See” references| Interchangeable abbreviations. Five entry types | Normal entries | Forbidden entries | ORM-D entries | Re-evaluation of data | Flammable liquids. Column 4 Identification numbers | International and domestic shipments | Column 5 Packing groups | Packing group exceptions. 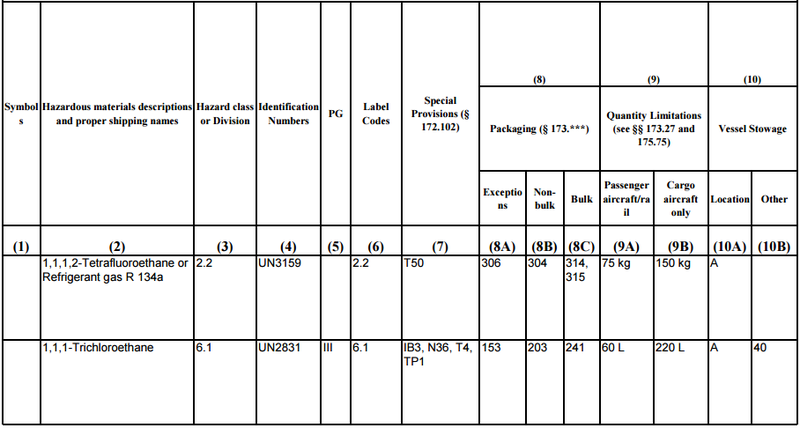 Special information | Label codes | Multiple label codes | Special provisions | Letter codes | Special provision alphanumeric codes. Packaging | Reading packaging entries | The solid / liquid table | Quantity limitations | Vessel stowage. Appendix A: Hazardous Substances | Table 1 | Reportable quantity | Mixtures and solutions | Table 2 | Appendix B: Marine Pollutants | Proper shipping names. The objective of this DOT HAZMAT Table (HMT) course is to meet the Federal Department of Transportation (DOT) training requirements for 49 CFR 172.704(a)(2)(i). Understand the information presented in the Hazmat Table and its appendices. This DOT HAZMAT online course consists of 9 sections, which students will complete through our Online Training System (OTS). The course includes interactive quizzes to help ensure retention of the training material. Upon course completion, you will immediately be able to download, save or print your Certificate of Completion which is provided in PDF format. We’ll also mail you a PVC credit card style Wallet ID Card with optional photo, showing training course completion. The card will be mailed within 24 hours of course completion. Please note that this this HAZMAT DOT HMT course is not meant to replace company-specific or function-specific training provided by your employer on equipment use and procedures for your particular work environment. You must be trained by your employer on the hazards, equipment, engineering and administrative controls, safe work practices and emergency plans specific to your role and workplace. Employers need to evaluate employee needs for additional DOT hazardous material training and training in the use of personal protective equipment used on the job.